For investors, the month of August saw a continuation of situations encountered year-to-date: strong economic growth, upward revisions to corporate earnings, no shortage of geopolitical or trade-related announcements, commitment from central banks to gradually proceed with stimulus withdrawal in the face of rising inflationary pressures – to name a few. 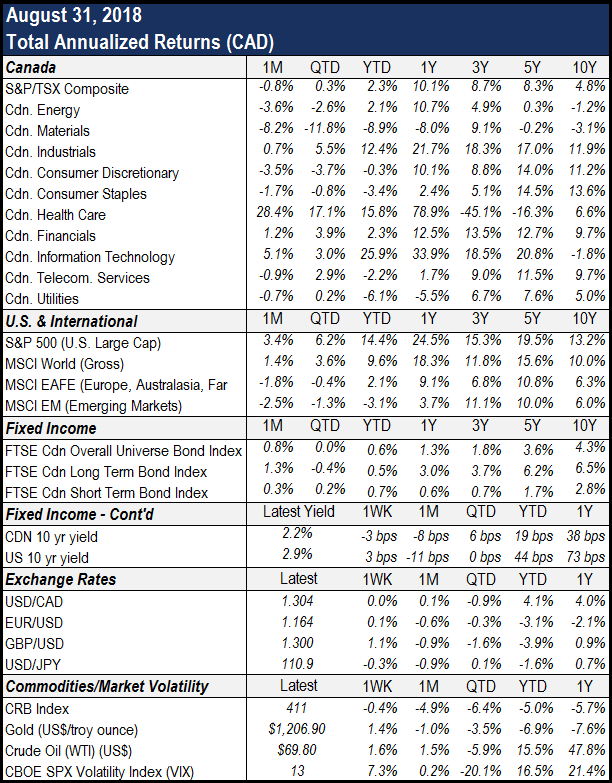 August’s economic and bond market news revolved around emerging market troubles and the pace of interest rate hiking. For the first few weeks, the spotlight was on financial difficulties in Turkey, which were magnified by the country’s political conflicts with the U.S. This caused the lira to tumble, and the contagion spilled into other emerging market currencies, stoking a flight to the relative safety of U.S. Treasuries. By the end of the month, it was Argentina’s currency calamity that dominated headlines. Overall, long-term bonds outperformed their short-term counterparts in August, and the Canadian bond market (FTSE Canada Overall Bond Universe) advanced 0.8%. With tax reform still a strong tailwind to an already hot U.S. economy, incoming data continues to support the Fed’s current path of policy tightening. Similarly, the Bank of Canada is expected to announce an interest rate hike in October, after choosing to maintain its overnight rate for the month of September. This is in line with the Bank’s commitment to pursue a gradual approach. Across the pond, ECB policymakers remark that the euro zone’s upswing remains solid amid strengthening wage growth. The ECB is expected to continue withdrawing policy support while keeping interest rates low in order to support the recovery. As investors returned from their summer holidays and began preparing for a new season, stock markets presented somewhat of a bumpy ride. Equities advanced to new highs in the first trading weeks of the month, lifted by continued economic growth and corporate earnings strength. Yet risk appetite dampened in the latter half as optimism over NAFTA’s going concern began to fade, and investors began eyeing a deadline for the next round of China-U.S. tariffs. Equity markets will be watching closely as the NAFTA negotiating table reopens this month. Canadian stocks (as measured by the TSX) erased some prior gains by retreating 0.8% last month, whereas U.S. equities (S&P 500) advanced 3.4%. Developed markets outside these two nations (MSCI EAFE) lost 1.8%, while emerging markets declined 2.5%. In currency markets, China’s central bank adjusted its methodology for fixing the yuan’s daily midpoint last month. 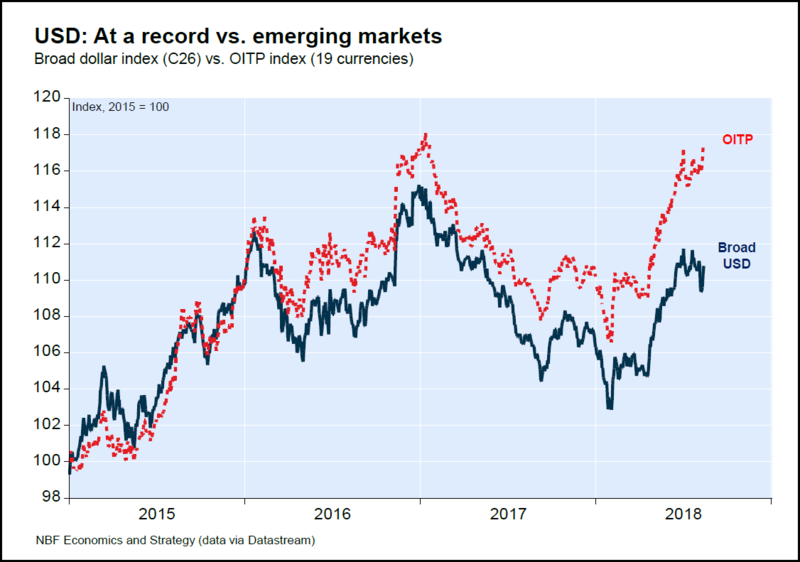 This is welcome news for financial markets, as it could reverse some of the greenback’s recent ascent, which has propelled it to record highs against a basket of 19 emerging market currencies (see chart). As Chinese equities continue recovering from recent sell-offs, the yuan’s stabilization could lend further support to commodity prices. Moreover, after rallying on the back of NAFTA optimism, the loonie faltered toward month-end, as a trilateral deal seemed slightly more elusive. Nevertheless, the loonie held steady against its U.S. counterpart for the month, closing at 76.7 cents CAD (or up 0.1%). Global oil markets tightened in August, as investors anticipated a decline in Iranian exports due to U.S. sanctions. With reduced supply from Iran, renewed strife in Libya, and Venezuelan export availability hobbled by an accident at a principal terminal, the list of bullish headlines grew, as supply is unlikely to be entirely offset by OPEC’s production boost. Crude oil prices advanced 1.6% last month. Despite trade tensions between President Trump and other nations, we continue to maintain a cautiously optimistic outlook on financial markets. A broad range of economic data indicates that the global economy remains in expansionary mode, albeit at differing paces. In addition, corporate earnings and wage growth remain healthy in developed markets. We are, however, mindful of the risks related to stimulus withdrawal, inflationary pressures and elevated asset valuations. While we still favour high-quality equities over cash and bonds, we have been slightly adding to cash equivalents in certain portfolios, with an emphasis on risk management and capital preservation.